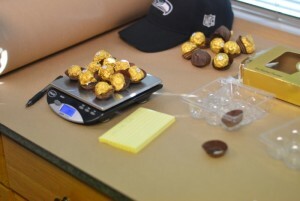 A South King County man is in the slammer, accused of painstakingly unwrapping the signature gold foil on Ferrero Rocher chocolate candies, replacing the chocolate and hazelnut bites with globs of black heroin, wrapping them back up and shipping the drugs to Alaska. The man, identified in federal charging documents as Jesus Rodriguez Horta, was supplying street-level dealers operating around Shoreline, North Seattle, and Edmonds, said King County Sheriff’s Sgt. DB Gates. A second man, who is believed to have been mailed the candy boxes and distributing the heroin, was arrested in Juneau. Horta, 46, was living in hotels in Kent and Renton, and had been sending packages to Juneau through the U.S. Postal Service. Detectives intercepted one of the packages shipped from Shoreline and found the drugs inside the distinctive gold foil, Gates said. “They had information he had been dealing drugs and heard he was mailing packages up to Alaska,” Gates said. On February 28, officers from the Juneau Police Department, assisted by postal inspectors, served a search warrant in Juneau. That same day, King County sheriff’s detectives and SWAT team members served a warrant at a motel in the 6300 block of South 212th Street in Kent and arrested Horta. Gates said they waited to put out information because there were sensitive elements of the case they did not want disclosed. While deputies did not find any Ferrero Rocher chocolates inside the motel room, they did find approximately 745 grams of heroin, 135 grams of methamphetamine, 90 grams of cocaine and 300 grams of ephedrine, authorities said. In charges, authorities wrote that they did find “plastic molds, which matched the shape and size of the balls of heroin concealed in the box of chocolates” where Horta had been staying.